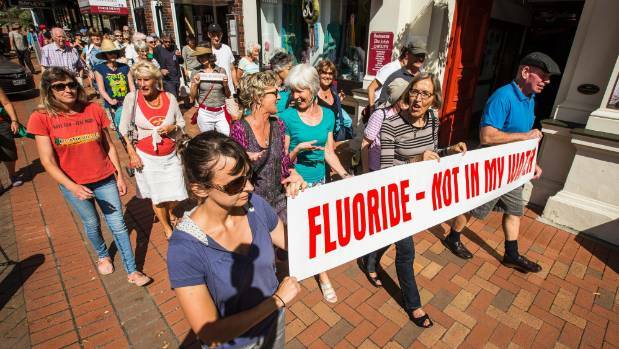 A group marched through Nelson’s main street to support keeping the city’s water fluoride-free, requesting filters and water-rate rebates if fluoride is added. More than 60 anti-fluoride protesters took a letter from the Church Steps to the Nelson City Council offices. The protest on Wednesday addressed their views in a letter presented on World Water Day. The letter addressed to mayor Rachel Reese and Nelson City Council CEO Clare Hadley stated it was “unethical to use our water supply to deliver a chemical …. for a forced treatment”. Educate don’t Fluoridate group members walk down Trafalgar St, to the Nelson Council Offices to protest against water fluoridation on World Water Day. It claimed fluoride required “expensive filtration equipment” to remove it from household water. If the chemical was added to the water, the council should provide funding to install filters for residents “who do not wish to have this toxin in their water”, as well as a rebate on water accounts “to cover annual maintenance”. The letter was passed to council with a short speech from Educate Don’t Fluoridate co-convener and Nelson Marlborough District Health Board member Judy Crowe thanking the crowd for their support, followed by cheers and clapping. Educate Don’t Fluoridate co-convener Cynthia McConville she was “thrilled” with the turn out. It was a great demonstration to the council that “there is support in the community for not having fluoride in our water because it’s not safe, nor is it effective”, she said. That claim is disputed on the Ministry of Health website which says water fluoridation has been used in many regions in New Zealand for more than 60 years with research showing it is “effective and safe in reducing tooth decay”. It says fluoridation is recommended by key public health agencies globally as an important contribution to health balance “as the benefit of dental decay prevention is greater for Maori, children and those in low socioeconomic groups”. The issue of fluoridation has caused a lot of debate throughout New Zealand and the Government is looking at legislation to shift the responsibility of water fluoridation from district councils to health boards. If it is passed, the health boards would have the power to fluoridate water supplies from next year. McConville said Educate Don’t Fluoridate wanted the decision on fluoridation to remain with council. Nelsonian fluoride protester Sky Landis said it was about “freedom of choice”.